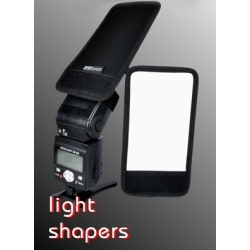 Lightchrom camera mount flash light shapers is made of a tough black ballistic nylon on one side and white polymer on the other, the black side can be used to keep the light flaring into your lens when using a flash as a background or hair light. The white side can be used as bounce card . for two light shapers can make a good barn door setup. 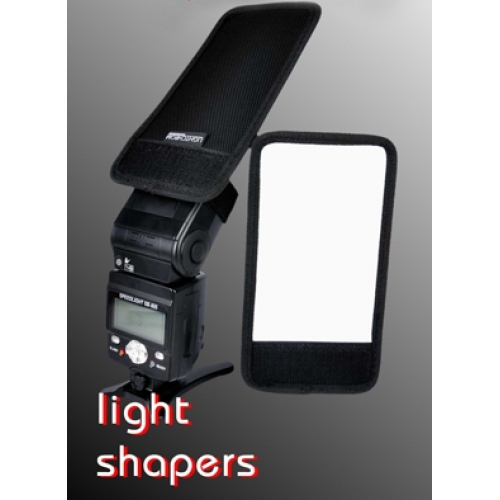 Light Shaper or better known as bounce card is useful for getting a top light effect which is fixed on the top of the flash gun. Very much useful for portrait photography.